Here’s a fun fact – teachers can enter most museums and galleries in Spain for free! I taught for more than 20 years before I found this out, so I’m sharing with any fellow teachers out there, so they can take advantage of free entry from now on — just take some proof of your profession. Don’t feel sad if you’re not a teacher though – you can visit most bits of the wonderful CaixaForum Madrid for free, and special exhibitions only cost 4€. I love this space so much. The building is gorgeous, with its living wall and architectural fields of matte aluminium and fountains framing the half-traditional brick, half -modernistic rusty pierced-copper clad building. The inside features a monumental white stairwell, a cafe on the top floor with views seen through the pierced metal cladding and a really exceptional gift shop on the first floor that is packed with desirable items. 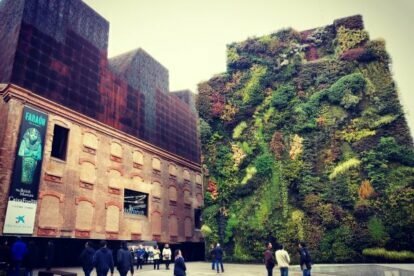 This centre is a good alternative to the nearby, more touristy Prado, Reina Sofia and Thyssen-Bornemisza Museums – it’s beautiful, cool, cheap and well-placed over the road from Madrid’s botanical garden. It’s also quite small, so if you don’t have much time, it’s the perfect size.